We are familiar with the idea that mass and energy are equivalent from the famous equation E= mc². If mass and energy are one and the same, why do we need two different forces- gravitational and electromagnetic? As photons ‘aggregate’ into matter, the resultant decrease in the number of ‘free photons’ or the energy level of the system (or the decrease in entropy) is probably what we appreciate as the gravitational attraction. And energy may be seen as a force that is responsible for the gravitational repulsion or antigravity. In other words an increase in entropy (energy level or disorder) is what causes the electromagnetic force and a decrease in the same (or creation of matter) is what results in the gravity. A decrease in entropy may create ‘antiphotons’ (?graviton) or ‘dark energy’ which could then mediate gravity. Or Gravity could be an innate property of matter in the universe in the sense that it may not require a mediator or carrier. Probably matter ‘naturally’ collapses into singularity in the absence of Energy. So graviton, the presumed carrier particle for gravity, may not be needed. So mass and energy are responsible for the same force but have opposite direction. It is thought that stars as they ‘burn out’ their energy reserves, collapse into bodies called neutron stars, white dwarfs and black holes depending on their mass. That means a star needs energy to oppose its own gravity and without this energy it collapses. If we take the Solar system, while the Sun and the planets get ‘attracted’ by the gravity, the energy that ‘pervades’ the solar family opposes their gravitational collapse. This energy includes the Sun’s radiation, the planets’ energy, and probably the ‘vacuum energy’. So if Sun runs out of its energy reserve, this not only results in its own collapse but probably of the whole solar family. There are several concepts in modern physics in the realms of cosmology and particle physics which appear weird and contradict our commonsense and reasoning. Constant speed of light: an observer measures the same speed of light irrespective of his velocity or the velocity of the source of light. Quantum uncertainty: things in the quantum world like a particle’s position, velocity, path, outcome of events etc can’t be accurately known. This is not weird as long as we put this down to our ignorance and inability to study the ‘quantum world’ and don’t consider this uncertainty as a fundamental property of the microcosm. These notions are based upon complex mathematical models/formulae, often put forward to cope up with or explain certain experimental observations/? errors, rather than reasoning and logic. But modern physicists argue that we can’t simply rely on our logical sense, because our perceived reality, which is the result of our brains interpretation of various things around us, may not represent the ultimate reality of the Universe. For example we see things like a chair or a tree because visible light rays from them interact with our retina from where signals are transmitted to the brain and it is our brain which interprets them and gives us the picture we see. This picture could be an illusion created by our brain. An alien looking at the same but whose brain/ retina can only process radio waves may not ‘see’ the same picture, so he may have a different understanding of the nature and ‘flow’ of things. They may feel that the earth is standing on the tree or our office comes to us rather than the other way. Their logic and sequence of reasoning may appear weird to our minds. It may be true that our perceived reality or the picture of our universe may just be an illusion and may not be the ultimate reality (and so is our logic and reasoning!). But then, how could mathematical formulae that are also the result of our brain’s activity can give us the correct picture of the universe or ultimate reality? So how can we swear on the weird concepts that contradict our logic and reasoning? Weirdness in science must be because of our patchy scientific advancement with gaps in our understanding of the nature. There will always be blanks in our understanding of any given issue however perfect we think our knowledge is. If we dissect and dissect our knowledge, we can realize that even the most perfect concept may be seen to contain lots of gaps or holes to be filled in. So if we can’t logically connect our perceived reality and the proposed weird mathematical theories, and achieve coherence, we must assume that there are big gaps to be filled in (or the weird theories are really weird!) rather than accepting this weirdness (quantum probabilities, fixed speed of light etc.) as the fundamental character of the universe. Though there will always be a limit to our knowledge both in depth and breadth, we must strive to achieve coherence. A coherent illusion is probably one of the faces of the ultimate reality. A startling conclusion that came out of the Einstein’s special relativity is that the speed of light is constant and is not dependent on the relative motion of the observer or the source. To get a gist of how weird is this conclusion- let’s take the example of a train moving at 100kmph towards east. A stationary observer standing on the platform measures the train’s velocity as 100kmph. An observer moving in the same direction as the train (east) at 50kmph will measure the train’s relative velocity as only 50kmph as anybody would expect. An observer moving at 50kmph towards west (in the opposite direction) measures the relative velocity of train as 150kmph. A ball rolling inside the train at 10kmph towards east (with respect to a passenger sitting in the train) will be seen to be moving at 110kmph (trains velocity +ball’s velocity) by the outside stationary observer. And a ball rolling at the same speed (with respect to a passenger sitting in the train) but in the opposite direction, will be seen to be moving at 90kmph towards east (trains velocity − ball’s velocity) by the outside stationary observer. This is what our common sense tells us- different observers measure different velocities for the train or the balls depending on their relative motion. But apparently, velocity of light will be the same to all the observers irrespective of their relative motion. If the velocity of light is ‘C’, an observer whether at rest, moving at 100kmph or moving at ‘C/2’ and irrespective of the direction of his motion relative to the beam of light, measures the speed of light as the same ‘C’. Also one apparently measures the speed of light as same ‘C’ irrespective of the source’s velocity. To support the above ‘weird behavior’ of light, another weird thing was theorized (one had to, obviously!) i.e time dilatation. To keep the speed of light constant, scientists made the time as relative. Apparently different observers/clocks measure different times for the same ‘duration’ in the space, depending on their relative motion. Clocks apparently run slower or in other words time dilates as one moves faster, and hence the speed of light remains constant. Also time apparently runs slower or time dilates near massive objects. Another absurdity which came out of the general relativity is that there is no such thing as gravitational force or attraction. Heavy objects like stars apparently ‘curve’ or warp the space-time around them and this warping of space-time is responsible for the perceived gravitational effects. Apparently planets do not go around the sun and apples do not fall to the ground, instead all these travel in straight lines in the curved space-time. This curved space time gives us the illusion of revolving planets and falling apples. Time dilation has been ‘proved’ experimentally by running two flights with equal velocity in the opposite directions, one east wards and another west wards. It was noted that the clock in the east bound flight recorded less time than that in the west bound flight ‘indicating’ time dilation. This is because, earth’s rotational velocity (as it spins towards east) gets added to the east bound flight making its relative velocity more than the west bound flight which runs opposite to the direction of the earth’s spin. If that was true I should imagine that clocks in some way get affected by gravity and their own motion (as can predicted by the gravity/acceleration equivalence) rather than there was any real time dilation or contraction. beam of light with velocity ‘C’ is shone towards the west. A west bound flight whose velocity is ‘0.2C’ will measure the velocity of light as only 0.8C unless its time gets dilated. Similarly the east bound flight with a velocity 0.2C will measure the speed of light as 1.2C unless its time runs faster. But we know that this was not the case from the above experiment. If there was no absolute time, certain things make no sense- velocity, acceleration, frequency etc. Due to the expanding universe, we on this earth are already moving at close to the speed of light relative to the receding galaxies at the ‘far end’ of our universe. This should make us immortal! Coming to the twins paradox, it is said that if one of the twins travels to the outer space at close to the speed of light, on his return from the space trip, because of time dilation, he would apparently be younger than his earth bound twin. But we could argue that the earth bound twin was also moving at the same speed relative to the space bound twin. So time should dilate for both them equally. As motion is a relative thing in this universe, the concept of time dilation for fast moving things is rather absurd. If time runs slowly near strong gravitational fields, it must have run increasingly slowly as we trace back our expanding universe to the point of big bang. As time runs infinitely slowly as we approach the big bang singularity, we would never ‘reach’ the stage of singularity, if at all this existed. Or at least the predicted time scale of events since big bang are totally wrong – one billionth of a second immediately after the big bang could well be equivalent to our 13.5 billion years, which is the estimated age of our universe! As time should run slower for the Sun than for the Earth, at some point of time, it is possible that our Earth gets older than the Sun and similarly our moon older than our earth. 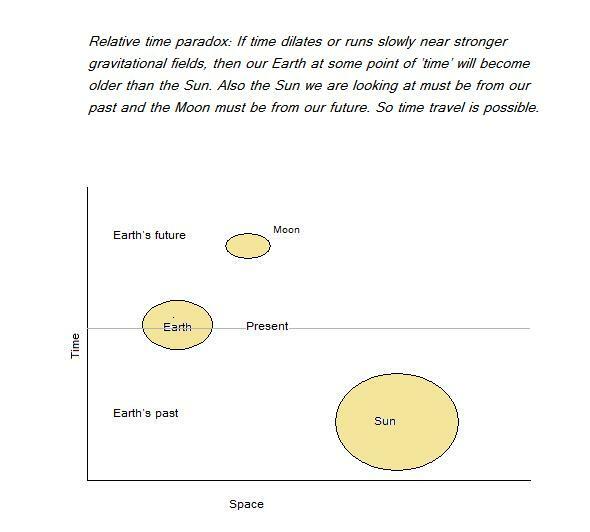 Also we are probably looking at the sun that is actually in our past and the moon which is in our future! So time travel is possible! According to the above model, an electron or a photon during its flight from point A to point B travels simultaneously in infinite number of paths and apparently what we see or observe is the average of all these paths. That means, amongst its infinite paths, could include a trip to the moon or even to the other side of the universe before the particle reaches point B. Even weird is that, the particle can apparently be observed at x, y, z points between A-B if we decide to observe it, but if we don’t ‘look’ at it, it can be wandering anywhere in the universe. It is as if the particle knows where and when someone is going to watch its behavior. We have to believe in this theory of odd behavior of tiny particles because they are seen to pass through both the slits simultaneously in the famous ‘double slit experiment’. So the reality we perceive (path from A to B) is apparently just one of the several probabilities/ histories/realities. An electron is apparently surrounded by a cloud of virtual particles that pop in and out of existence. Virtual particles are particle/ antiparticle pairs (electrons/ positrons) that get created from the ‘vacuum’ and disappear by annihilating each other. If this picture is true, the created particle/ antiparticle pairs may not adhere to and behave with sanctity and it is possible that the original electron may get annihilated by one of the virtual positrons created ‘next’ to it. So the position of the ‘real electron’ keeps changing in the cloud and we may feel that its exact position is unpredictable. This unpredictability is more to do with our ignorance and not to be considered as a fundamental character of the particle and I will clarify more on this later. So this electron cloud when shot, is likely to travel through both the slits simultaneously and how much of the cloud goes through each slit depends on the size of the cloud (likely to be infinite), the distance between the slits and the direction it is shot. Imagine that some giant aliens, of the size of our universe and who live longer than this universe, are trying to study humans (much smaller than their ‘Planck’s length’!) whose presence they can barely feel. For them we may be like virtual particles who just pop in and out of existence from nothing. But they may be able to appreciate the existence of a ‘governor’ surrounded by a cloud of virtual humans. But they surely get confused and say that this governor is unpredictable like we have been talking about the electron. They probably can’t guess that, this man actually keeps changing very often and comes (gets elected) out of the virtual humans, and that the term of/life of each governor is much smaller than the life of the ‘virtual humans’. We know that the election of a governor or president is not a random or an unpredictable event and if any uncertainty exists, that is only because of our inability to read the human minds. Uncertainty or unpredictability, whether it is in our everyday life or quantum world or cosmology, exists not because Nature is fundamentally endowed with this property, but because of the limitations we as humans have got in understanding the Nature and creation. Luckily we have a way to look beyond our ignorance ie by statistics/probabilities. Now back to our electron clouds again. If we enlarge the electron cloud and slow down the time sufficiently, we will probably see a similar picture like the ‘human clouds’ described above. The mere act of observing a particle will affect its position and velocity but this is because our inability to observe the particle without interfering with it. So the uncertainty that results from our inability can’t be a fundamental property of the tiny particles. Imagine that giant aliens are studying the golf ball ‘particles’ which are too small for them to see. For this they have to throw some ‘visible particles’ on to them and then analyze how these ‘visible rays’ get affected. Depending on this information, they can draw indirect conclusions about the golf balls- their position, velocity, mass, energy etc. If their ‘visible particles’ are of the size of a foot ball, then the moment a foot ball particle hits/interacts with the golf ball under study, the golf ball’s properties get altered including its position and velocity. More over how the foot ball particle gets affected when it hits the golf ball depends on all the above parameters of the golf ball, so it is difficult to accurately predict the value of each of them separately. (grains- quanta). So ‘quantumness’ exists in the classical world as well. In the classical world, things are assumed to take place in a continuous fashion like that of flow of water. But like the energy in the quantum world, water also flows in definite quanta i.e. molecules and it doesn’t flow in half or quarter molecules. It’s great that Max Planck discovered that energy ‘moves’ in definite quanta unlike what we had assumed before, but this is not a weird thing and doesn’t require weird science that discards our every day experience as unreal or illusion. Time and again scientists have adorned the concept of fundamental particles of matter despite having disproved several times. Common sense predicts that no particle can be taken for granted as fundamental. Every particle, let it be a quark or lepton or photon, must be made of/ composed of something more fundamental. If scientists consider some particles as the ultimate particles, that only indicates the limit of their mathematical imagination and available technology. Going back to the electron cloud and the virtual particles story, if we broaden our mind and magnify the spacetime, we may see the virtual particles as real particles, appreciate the vacuum fluctuations and realize that the ‘vacuum’ is not really empty. We may also realize that the virtual particles just don’t come out of nothing but are made from something more fundamental. get detached from the ‘scientific world’ and become selfless. They attain what is called Moksha and experience Bliss or eternal happiness.